A new awareness for Korea grew out of the end of the Korean War. At the University of Pennsylvania, it meant for more attention and time to be devoted towards fostering education about Korea on campus and having more relations with Koreans than ever before. Unfortunately, at the end of the 1950s, a Penn student from Korea was viciously murdered in Philadelphia named In-Ho Oh. 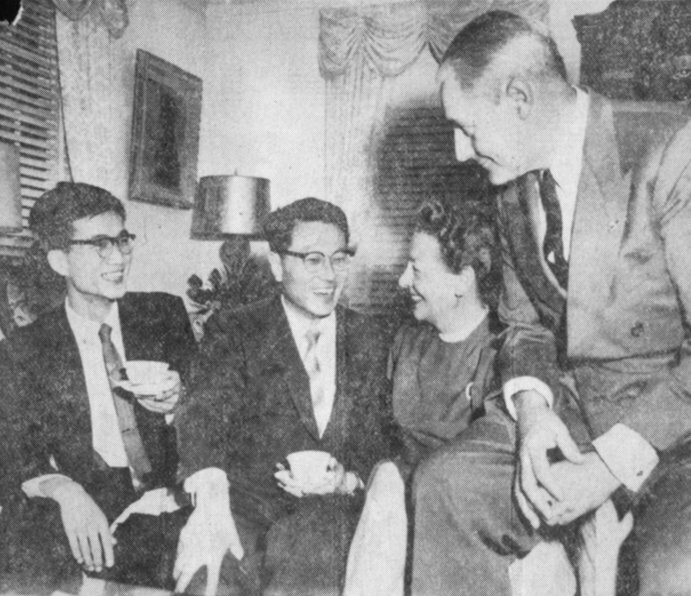 To honor his memory, the In-Ho Oh scholarship was created at Penn and would bring more Koreans over to study at the campus. Some such students were Young-Moo Shin and Hyong-Kap Kim (pictured above). In-Ho Oh’s aunt, Mrs. Za Yung Oh also studied at the University of Pennsylvania campus; she studied voice, and performed in 1959 at the Polio League of Philadelphia at Chateau Crillon, singing with the Korean harp. That same year, the Mayor of Seoul, Korea, Huh Chung, was the guest of the Trustees of Penn. At the University Museum on May 15, 1959, a tea was held in his honor. He greeted the two In-Ho Oh scholars, as well as other Koreans in Philadelphia area institutions, and was the guest of the Mayor of Philadelphia (who had also previously greeted the two In-Ho Oh scholars), Richardson Dilworth. Another close tie of Penn to Koreans was one that developed out of the Glee Club’s Director since 1956, Bruce Montgomery. Montgomery had served in the Korean War and had met an orphaned boy while in active service at Yang-gu, located near to the Hwachon Reservoir. He and some other men gave the boy the name “Cheesai” which meant “little” in Korean and Montgomery sang American songs to him. “Cheesai,” in return, sang Korean folks songs back to Montgomery, who brought music manuscripts he had written back to Penn and which the Glee Club performed. Influenced by the “Cheesai” story, the Glee Club adopted another Korean boy, Chung Woo Won through Overseas Children, Inc. in New York. They donated spare change to their cause at every rehearsal. In this way, the Glee Club of the University of Pennsylvania helped to support the Korean boy, who was able to advance in his primary education. The Van Pelt library made an exhibit of Korean history and culture in March 1977, displaying Korean costumes, chinaware, furniture, scrolls, etc. as well as the some of the Korean literature collection the library owned. Four years later, “A Winter Concert” was presented by the Korean Cultural Society of the University of Pennsylvania (an undergraduate organization) at the University Museum, which four young Koreans performed in.